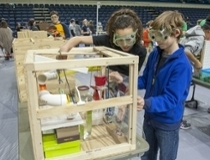 On Saturday, March 4, nearly 1,000 middle and high school students will compete in the Regional Science Olympiad, held on the UNCW campus and hosted by the Watson College of Education. Coordinated by WCE’s Center for Education in Science, Technology, Engineering and Mathematics (CESTEM), this event will engage 70 student teams with a variety of activities to teach them about STEM. In addition to the day’s events, 46 possible scholarships totaling up to $23,000 will be awarded, along with medals and trophies. Winning schools will compete for state honors in Raleigh on April 22. For more information, visit Watson College’s Science Olympiad news article.